Combine contents with 6 cups of water. Bring to a boil. Reduce heat and simmer for 20-25 minutes, stirring occasionally. Garnish with shredded cheddar cheese and bacon. Serve in a hollowed out round loaf of bread. Scoop out the center and spoon in the soup. Dehydrated potatoes (sodium bisulfite),wheat flour, creamer (partially hydrogenated soybean oil, corn syrup solids, sodium caseinate, mono and diglycerides, dipotassium phosphate, soy lecithin), cheddar cheese powder [cheddar cheese (pasteurized milk, cheese cultures, salt, enzymes), whey, salt, disodium phosphate, lactic acid], modified corn starch, bacon (cured with water, salt, sugar, sodium phosphates, sodium erythorbate, sodium nitrite, smoke flavor), salt, natural flavors [heavy cream (whey protein concentrate,whey), yeast extract, maltodextrin, annatto and turmeric extract, cultured potato extract, barley, malt flour], dextrose, dehydrated onion and garlic, chicken fat (extract of rosemary), sugar, titamium dioxide, spice, chives, disodium inosinate and disodium guanylate, fd&c yellow lake 5&6. Worst soup i’ve Ever eaten. I have never had potato soup from a can that actually tasted homemade. This is thick and rich...full of flavor! I have used it as a base in a lot of recipes too and it has worked well. It was great and so easy. A fast meal and yet like I had cooked all afternoon. Best potato soup from a package! Add bacon crumbles and cheddar cheese on top before serving! Very good! This packaged soup was outstanding. I added some canned kernel corn and topped it with grated cheddar and my husband and I enjoyed two bowlsfull. 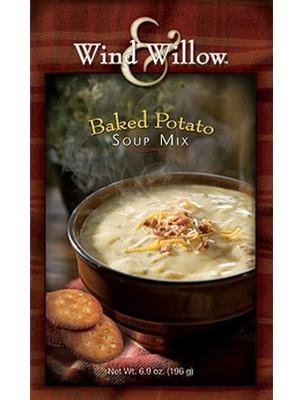 I'm usually disappointed with packaged mixes but this soup is a winner.